Of all the blend modes that Photoshop has to offer, the dissolve blend mode is probably used the least, since it creates a scatter of hard, ugly pixels. After using Photoshop to edit my images for over a year now, I’ve finally come across a useful technique which utilizes the dissolve blend mode to save time and frustration. And today, I want to share it with you. Before I begin, note that this technique is only suitable for noisy images. For this example, I will be using an image I shot earlier this month with my Canon 6D and 24-105mm lens. Since there was very little light in the room, my ISO was set to 5000, which enabled me to maintain a shutter speed of 1/250 to freeze the garter in mid-air. 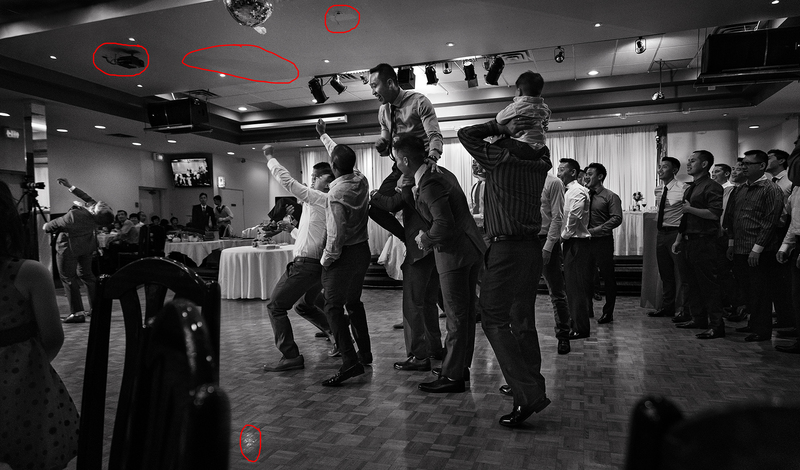 After converting the image to black and white, I noticed a number of distracting objects in the image, such as the projector hanging from the ceiling, and the white patch of light on the dance floor (see objects circled in red below). Usually, a combination of cloning and patching works fine, but because of the noise in this image (which I wanted to retain), these techniques weren’t working for me. For instance, if I decided to use the clone stamp at 50% opacity, enabling me to blend better, I would have left noticeably soft areas. So it occurred to me that if I used the dissolve blend mode when cloning, I could re-create noise as I was painting, and darken or lighten areas to my liking by sampling from darker or lighter parts of the image. I also found that painting at 15% opacity while using the clone stamp on dissolve gave me the best results. 1) Create a new layer. 2) Paint or clone out the problem areas (i.e., the projector or white patch of light) at 100% flow using a softer brush. 3) Select the Clone Stamp and change the blend mode to Dissolve, lowering your opacity to 15%. 4) Alt + Click to sample and paint as necessary. 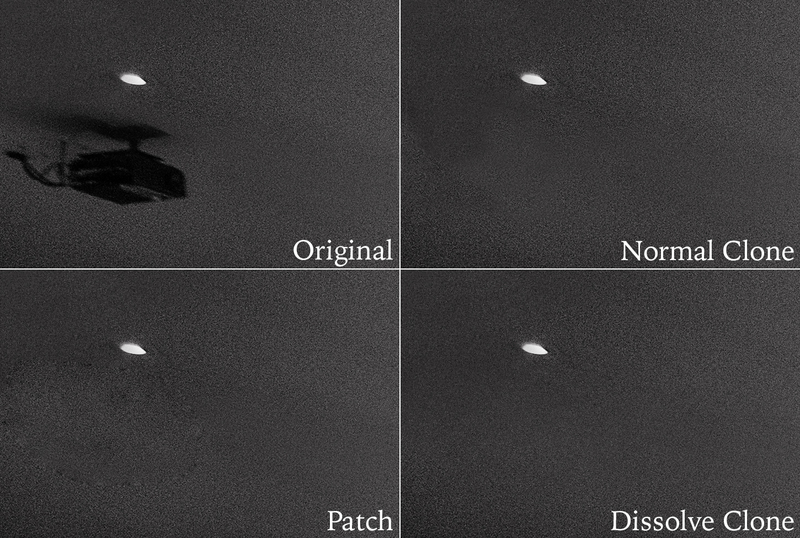 See the image below for a comparison of patching, normal cloning at 100% with a soft brush, and dissolve cloning at 15% opacity with a hard brush. Pay attention to how the Patch tool leaves edges, and how normal cloning can still leave spots that don’t blend well together. My friend Vlad pointed out that I could have de-noised the image first, did my patching and cloning, and then added nicer-looking noise back in—but if you’re like me and you’re afraid of stripping the image of detail and/or just want to avoid extra steps, this method will do fine. So there you have it. Finally, a useful function for the dissolve blend mode! If you liked this tutorial, let me know in the comments section or follow my blog/like my Facebook Page for future posts and updates.